Entrepreneurial Journalism Helping the Charlotte Observer figure out what, where, when and how millennials consume news. Millennials are a hot topic right now. What trends did your class focus on? I don’t care if you’re McDonalds or Honda or a newspaper, you cannot ignore the millennials. This demographic, usually defined as 18- to 35-year-olds, is bigger than the baby boomers. Boomers used to be the big spenders, but they are aging out of their consumer years. The millennials are forming households — that’s their prime area for spending, and if you don’t get them now, you’ve just lost them to your competitor. This class on entrepreneurial journalism focused on helping the Charlotte Observer develop new products, features, campaigns or events to help North Carolina’s largest news organization attract more younger readers to its website, mobile and print editions. That’s actually been a goal of a lot of papers over the past 40 years — how to catch the elusive younger reader. W&L has sent a number of summer interns to the Observer in the past, and they loved the idea of hosting us and opening up their newsroom to the class. The paper has gone through several downsizings, which has pretty much decimated its staff. In fact, one of the things that shocked the students when we were down there was how few people there were in the newsroom. Right now, and this is true of most papers, the print edition is a very minor part of their production. Papers are far more invested in digital content, and I think the biggest weakness for the Observer is that it doesn’t have enough millennials in its newsroom. How did you prepare for your trip to the Charlotte Observer? We spent the first two weeks in the classroom and covered a lot of the basics of introductory journalism — why do we care about news, why is it important for democracy, and how do we pay for it with declining advertising revenues. We also discussed the latest trends in entrepreneurial journalism, from start-ups to incubators inside legacy news organizations. We took a deep dive into market research and practiced how to interview people about what, where, when and how they consume news and information for their daily lives. The CO also gave us its millennial playbook from the last time it studied this issue, which was awesome. The students absolutely devoured it. Then we parachuted into the Charlotte Observer’s newsroom for three days to observe how journalists operate in a 24/7 digital world. The Observer’s marketing and advertising folks talked about different strategies to attract more revenue to its products. 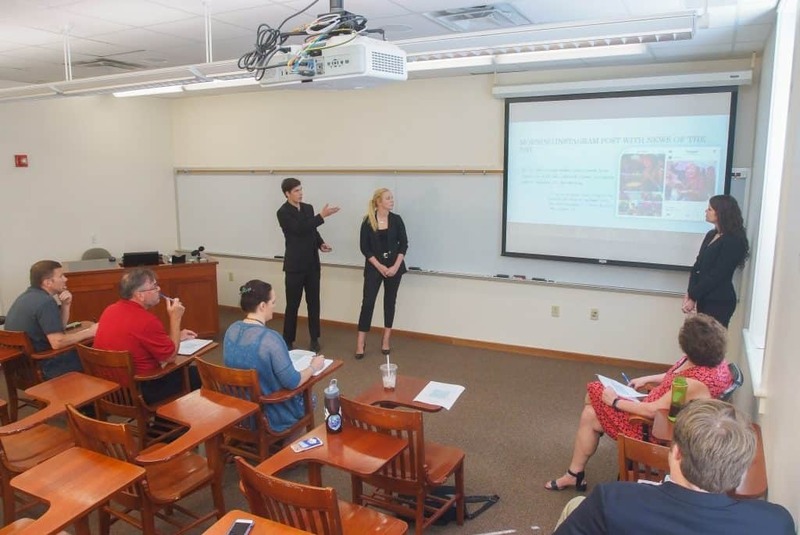 The students, grouped into three teams, held focus groups with readers to gauge their interest in each team’s idea before hitting the streets to interview more millennials about what they like, dislike or crave from local media outlets. On our return, the teams worked on their pitches based on the research they did in Charlotte. The final day of class they presented their ideas to their classmates, guests and a panel of judges, including an editor from the Observer. It was like “Shark Tank.” It’s been great to see their adrenaline flowing. One of them ran the financials to create a profit and loss statement. Another proposed a mobile app, while a third team redesigned the Charlotte Five website. One team even put together a newscast. The biggest question they had to be able to answer is who is going to do the work to create new content and who is going to pay for it. I told them to get creative. There’s no wrong answer. These are nuggets of ideas that the Observer can build up. I can’t wait to see how the Observer uses their input.